The Torbay catchment has a variety of bush areas, ranging from small, scattered remnants to large blocks. These are found on both private property and in public reserves. The nature reserves managed by the Department of Environment and Conservation (DEC) are Marbellup, Down Road, Barrett’s Meadow, Lake Powell and the West Cape Howe National Park. There is also the large tract of coastal Crown land that joins the West Cape Howe National Park to Torndirrup National Park. In all there is about 11,500 ha of remnant vegetation in the Torbay catchment. This is around 36% of the catchment. Aside from these bush areas, many farms have scattered paddock trees, windbreaks or vegetation along drains and creeks. These can provide valuable corridors and should also be protected and enhanced where necessary. What role does the bush have? Bushland has a range of different values and provides ecosystem services that has benefit to our whole community. Habitat for native birds and animals. Micro-climate values: shade and shelter for humans, animals and crops. Pollination of crops by birds and insects. Providing a habitat for birds and insects that help protect crops and pastures from pest attack. Filtering water or providing areas of clean water supply. Protection of soil by reducing wind & water erosion. Whose responsibility is it to manage the bush? Management of bushland is the responsibility of the landowner, whether that is an individual, business or government agency. While having bushland is a privilege, we recognise that looking after it may put added pressure on already busy farmers. This is where the Torbay Catchment Group and other organisations are able to help. Remember, native vegetation is protected by law in Western Australia under the Environmental Protection Act 1986. Most types of clearing are prohibited unless a permit has been granted. The Department of Environment and Conservation manage the vegetation clearing permit system. How do I care for bushland? if you have stock it is very important to exclude these animals from your bush. Animals will graze native vegetation preventing regeneration and thin the understorey which will lead to the eventual loss of the bushland. Grazing stock also brings in weed seeds and encourages weed growth by disturbance and nutrient enrichment of the soil through animal excrement. Weed control is one of the most important issues that land mangers face. Weeds have the ability to outcompete and smother native vegetation. This will lead to the decline of the native plants and loss of natural recruitment. Weeds will also increase the fuel load in the bush and the risk of fire. When undertaking weed control start from the good areas and work towards the poor. Bushland doesn’t exist in isolation. Look for weeds surrounding the bush, in the paddock and elsewhere on your property and your neighbour’s property. Some weeds, such as Blackberry are declared plants. Declared plants are those plants that have been identified by the Department of Agriculture & Food WA as being, or potentially, a serious threat to agriculture. Landowners have a legal responsibility to control declared plants on their property. Environmental weeds are those weeds that are a threat to native vegetation and ecosystems. in our region, serious environmental weeds that are threatening the values of the local bush are: watsonia, Sydney golden wattle, Victorian tea-tree, taylorina, pampas grass, dolichos pea and pittosporum. Bulrushes and arum lily are problem weeds in wetlands. For information on controlling these weeds contact the Torbay Catchment Group. Pasture species such as kikuyu, have the potential to become weeds in bushland. You should always provide an adequate buffer between paddocks and bush areas. The size of the buffer will generally depend on the type of pasture and the size and quality of the bush being protected. A shelter belt of local trees provides a good buffer, with their shade reducing weed growth while providing protection for stock. Creating wildlife corridors to create linkages to other bush areas and reserves allowing birds and animals to travel through the landscape. Corridors should be planted as wide as possible and include a variety of plant types – trees, shrubs and ground covers. Retain dead trees and logs in the bush as they provide valuable hollows that are necessary for many animals to nest. if you have a shortage of hollows in trees, you can install nesting boxes. Nest box design is species specific and installation location is critical. Seek advice from the Department of Environment and Conservation’s Land for Wildlife officer. Ensuring a good, dense mix of local species is present, including all layers from groundcovers to trees. Fire is part of the Australian landscape. The land has been managed using fire by Aboriginal people for thousands of years. However, altered fire regimes in more recent times has meant that some ecosystems may now function differently and the effect of fire can be unforeseen. Fire may result in the proliferation of weeds, potentially increasing fire frequency and changes in native species composition. As a result of this, it is important to understand the plants and animals in your bush and the areas fire history. if you are thinking about using fire as a management tool we encourage you to seek further advice. A good starting point is to read ‘Wildlife Note 17: The Use of Fire in Small Remnants’ by the Department of Environment and Conservation. Healthy bushland has a vertical structure that contains multiple layers. This includes fungi in the soil, groundcovers, shrubs and trees. The amount of each layer will vary between different vegetation communities. if one layer is missing the ecosystem will not be fully functional. Disease can affect bushland when either a pathogen that is foreign enters the system, such as Phytophthora dieback, or when some native species become more vigorous than they naturally should be. This can happen with some native fungi (such as Ghost and Honey fungus). Phytophthora dieback is a very serious disease, now referred to as the “biological bulldozer”. You can often identify possible Phytophthora dieback by yellowing or dead canopy, especially on Banksia, Jarrah and Sheoak. It is almost impossible to eliminate Phytophthora once it is present in your bushland. The most important first step is to identify any areas in the bush that are infected with Phytophthora. This may require professional assistance. You can help prevent the disease spreading to healthy areas by not moving soil and plant material around, keeping to tracks, cleaning tyres and equipment before going into disease free areas and ensuring additional water is not added to the bushland. infected bushland can be treated by spraying or injecting susceptible species with Phosphite, this should be done every three to four years. often just the ‘frontline’ needs to be treated to prevent movement of the disease from one area to another. When native fungus becomes a problem you may notice more trees than normal rotting and falling over. This usually happens when a new factor such as alteration to drainage patterns or loss of understorey occurs. These must be addressed to solve the problem. If your bushland is degraded you will want to improve it, but how do you go about it? Restoration is allowing the bush to naturally regenerate itself, with a helping hand in the form of weed control, pest eradication, stock exclusion and fire management. Restoration relies on there being viable seed available from plants already growing there. This may require having the right pollinators too, which very degraded bush may lack. Restoration is often the best solution as not only is it less expensive and time consuming, but the new plants will come from genetic stock adapted to that area. Start in the least weedy areas, removing weeds with minimal disturbance. Revegetation with local native species may be required if a site is very degraded. if you need to revegetate, try collecting seed from your bush, or from a nearby source to propagate or direct seed. Local plants grow best in local areas. if purchasing plants at a nursery, keep the provenance (the area seed was sourced) of the plant in mind. 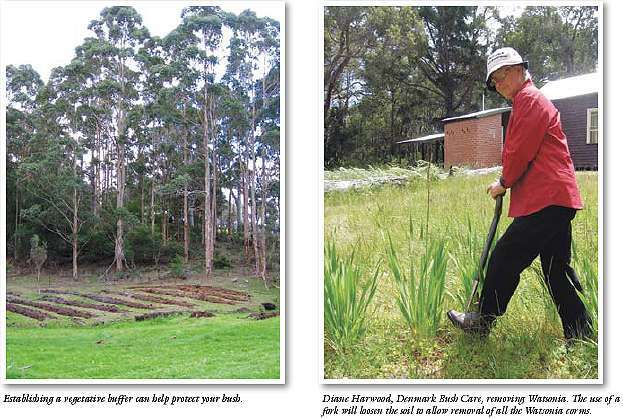 For more information on site preparation and planting see the Torbay Catchment Group’s publication “Your Guide to Successful Revegetation in Torbay Catchment”. The Torbay Catchment Group may have funding available to help you protect and enhance bushland on your property.